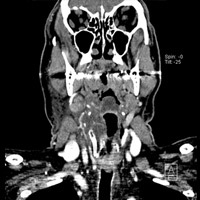 A 68-year-old man presented to the emergency department (ED) with one day of rapidly progressive throat pain. The patient reported rhinorrhea within the preceding few days, which was followed by mild difficulty swallowing and sore throat. Upon reporting to his primary care physician, the patient was febrile to 102 and instructed to visit the ED, where physical examination revealed exquisite tenderness along the anterior and right ventrolateral neck at the level of the mandible. 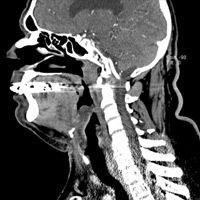 A CT scan of the neck with contrast was performed. Although vital signs were initially stable, the patient’s blood pressure began to drop precipitously into the 70s/30s. IV access was secured; pressors and IV fluids with antibiotics were initiated, and the patient was transferred to the ICU. The otolaryngology service opted against emergent intubation and followed with close observation. Multiplanar images from a CT scan of the neck with IV contrast demonstrated asymmetric narrowing of the airway secondary to mucosal thickening and submucosal edema involving the oropharynx, hypopharynx, and supraglottic larynx (Figures 1A, B, and C). The right vallecula and pyriform sinus were nearly obliterated. Perhaps the most striking finding was a masslike swelling/inflammation of the epiglottis and contiguous aryepiglottic fold. There was also infiltration of pre-epiglottic fat. No tonsillar or retropharyngeal suppurative adenitis or abscess was identified. Scattered nodes within the adjacent cervical stations were appreciated, none of which met pathologic size criteria. Epiglottitis in children is a well-known entity that has potentially life-threatening implications (ie, rapid airway compromise). A high degree of suspicion is warranted in the pediatric setting, so emergent intubation and antibiotics are initiated promptly. Empiric antibiotics, IV hydration, and close observation of airway stability are fundamental to management of AE in adults. Only a minority of patients require intubation. Outcomes are generally favorable if clinicians and radiologists operate in concert to establish a diagnosis and initiate the appropriate therapy. — Rahul V. Pawar, MD, DABR, is an attending neuroradiologist at Saint Barnabas Medical Center in Livingston, N.J.
McVernon J, Trotter CL, Slack MP, Ramsay ME. Trends in Haemophilus influenza type b infections in adults in England and Wales: Surveillance study. BMJ. 2004;329(7467):655-658. Wick F, Ballmer PE, Haller A. 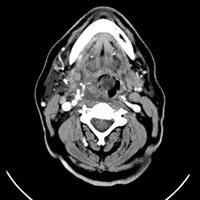 Acute epiglottitis in adults. Swiss Med Wkly. 2002;132(37-38):541-547. Hawkins DB, Miller AH, Sachs GB, Benz RT. Acute epiglottitis in adults. Laryngoscope. 1973;83(8):1211-1220. Nemzeck WR, Katzberg RW, Van Slyke MA, et al. A reappraisal of the radiologic findings of acute inflammation of the epiglottis and supraglottic structures in adults. AJNR. 1995;16(3):495-502.